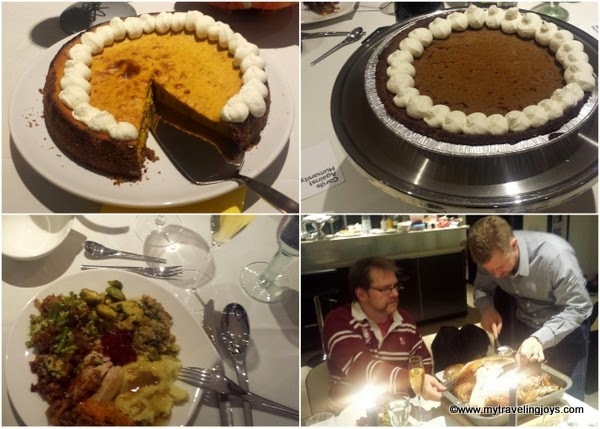 Yes, it’s been 9 days since we celebrated Thanksgiving with our friends in Germany. However, we spent three extra days visiting the infamous German Christmas markets, so I still have hundreds of photos to edit. Then, I taught a baking class and have basically been trying to catch up on our “normal” life here in Warsaw. I am happy to report that both the Polish and German airport authorities seemed to have no problem with me transporting my Pumpkin Pie with Gluten-Free Coconut & Almond Crust across the borders. The pie arrived safely! 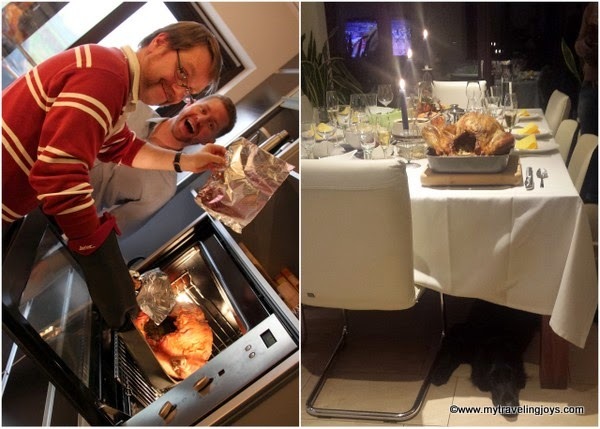 Our dear friend, JT, whom we stayed with in Düsseldorf, had prepared the majority of our Thanksgiving meal in advance. This, his friend, Tobias, whom we met during our beer weekend in Prague, kindly picked us and ALL our Thanksgiving meal fixings up in his large SUV. We drove to T’s suburbian home because it had more room to host our Thanksgiving meal. T and his wife, Dee, also have a lovely and practically professionally-outfitted kitchen so I had every gadget at hand to help prepare our dinner. Dee set up a lovely dining table for us. JT and me in the midst of cooking green bean and sweet potato casseroles. JT and hubby checking on the turkey, which was closely guarded by the family dog later. JT was in charge of his bacon-wrapped turkey, cranberry sauce, pumpkin soup, grandfather’s recipe of sweet potato casserole, mashed potatoes and stuffing/dressing (made with gluten-free cornbread). I helped here and there and made my classic green bean casserole with a cheesy béchamel sauce, roasted Brussels sprouts and helped finish the pies. By the time we sat down to dinner, we had already been drinking a bit of bubbly and wine, as one should when they are cooking. 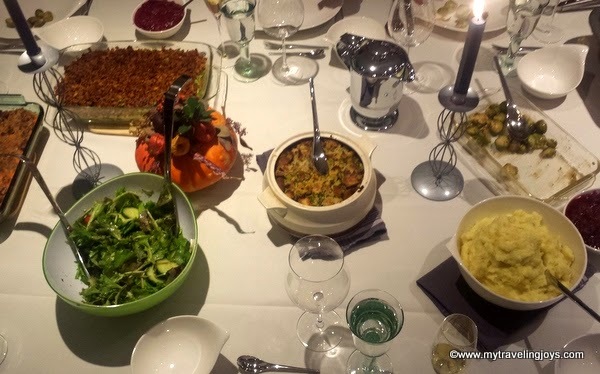 The best part was sharing this delicious meal with friends from the U.S., Germany, Turkey, U.K. and Poland, making it a true expat Thanksgiving! Celebrating Thanksgiving together always makes me reflective on what I’m thankful for in life. This year has been a bit of an emotional one for me personally as I keep hoping and trying (unsuccessfully) for a baby. I’m thankful to have such a wonderful and supportive husband as we’ve gone through these low periods this past year. 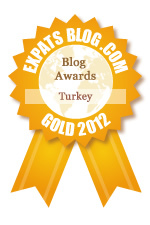 Secondly, I’m thankful to live abroad and travel as much as we do. I’m also thankful to have a fantastic group of friends from all over the world, and it’s even more special to celebrate these holidays together. As long as you have good food and friends, you can celebrate an American Thanksgiving anywhere! A Thanksgiving collage of food photos. Looks like you had a great Thanksgiving feast. Glad you had fun exploring all the German Christmas markets. what a wonderful thanksgiving! can't wait to see market pics!